I love how things can sometimes go full circle. 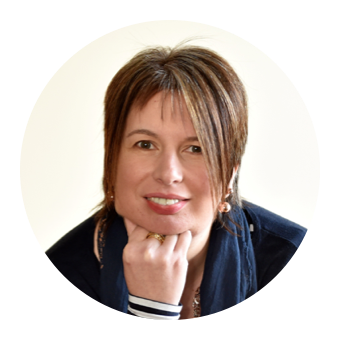 Back in May 2013 when I'd been blogging for less than nine months I was terribly excited to be invited to my very first blogger event. A tasting in the Kailyard by Nick Nairn at Dunblane Hydro. 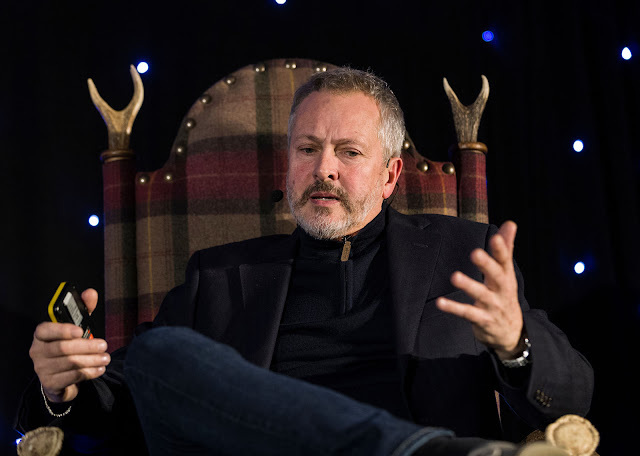 Fast forward to last Friday night and I was invited once again to the Hydro, this time for an overnight stay and to attend An Audience with Nick Nairn. 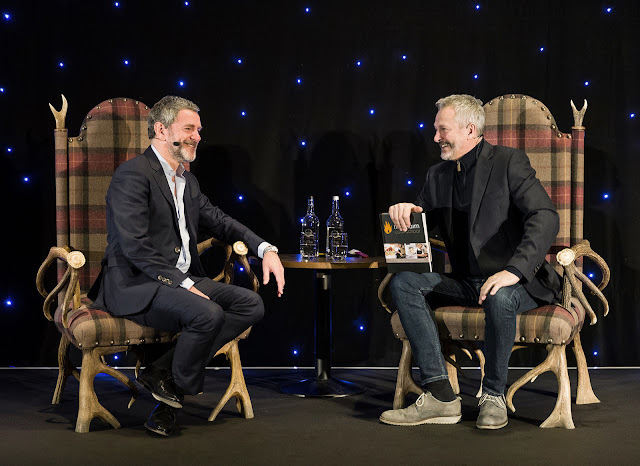 In the intervening 4 years my path has crossed with Nick on a number of occasions so it was lovely to join him as he celebrated 30 years in the business as a successful chef, TV presenter and entrepreneur. With Stephen Jardine as the host with the most we knew we were in for an enjoyable night. With drinks and canapés from 7pm we had a wee bit of a rush to head south on a Friday night and as we hit the A9 after Perth snow began to flutter. Whilst I've been to Dunblane Hydro on a number of occasion I thought it best to rely on the Sat Nav for directions given the dark night and inclement weather. Big Mistake. The automated voice announced "You have reached your destination" in the middle of a housing estate! We could actually see the hotel but couldn't reach it! When we finally checked in at 6.55pm the receptionist told us that guest getting lost enroute was a regular occurrence. A quick change into a frock, spritz of perfume and tszujing of hair and make up (that was just foodie loon!) and we were were presentable. Alas such was the rush that I didn't manage to photograph our room in its pristine state. Suffice to say it was spacious, clean, comfortable and modern with a huge bathroom and lovely views over the hotel grounds. 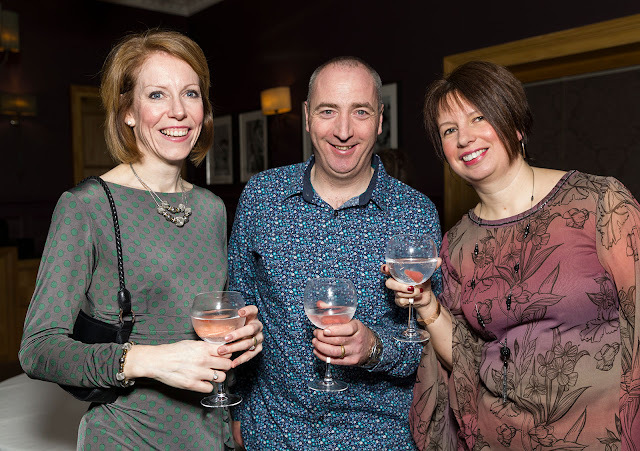 The Edinburgh Gin and Tonic was most welcome after our slightly stressful arrival and we mingled with other guests in the Wallace Lounge before heading through to the Strathallan Suite for the main event. 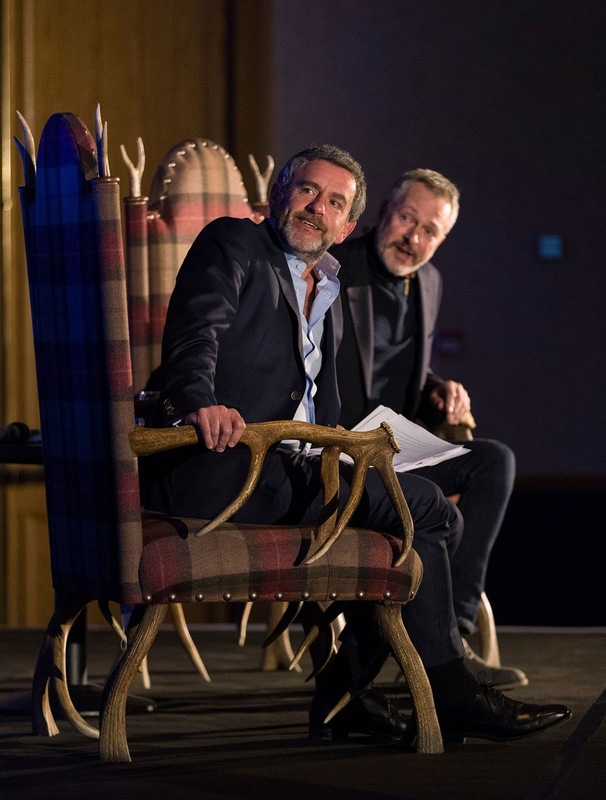 It soon became apparent that the evening would consist of a Game of Tartan Thrones. These gorgeous chairs usually sit at the front door of the hotel and we took the opportunity to take our own selfies in them the next morning. Nick and Stephen arrived on stage and reminiscent of This is Your Life the evening began with a selection of embarrassing baby and teenage photographs moving on to Nick regaling tales of his life in the Royal Navy from the age of 17 and his discovery in the Far East that there was more to food than mince and tatties. 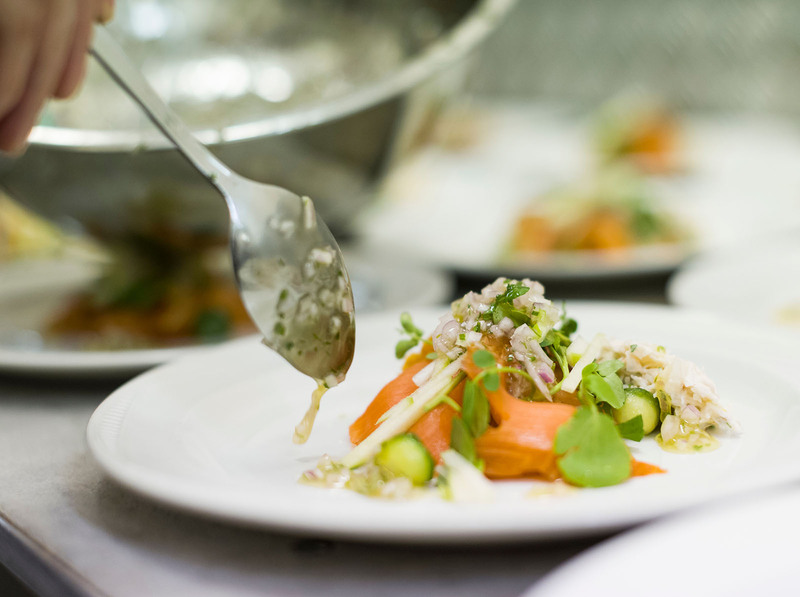 Time to eat our first two courses which comprised of Smoked Scottish Salmon and Cauliflower Veloute before the next part of the story. With a passion for food, Nick left the Navy and despite never having been to catering college, working in a restaurant or being tutored by any chef he formulated ambitious plans to open a restaurant in a disused Mill at Braeval, near Aberfoyle. Aged 27 his first job in the industry was his own restaurant. It was by no means plain sailing with many hiccups along the way and 100+ hour working weeks but the reward came in 1991 when he became the youngest Scottish chef to win a coveted Michelin star. Time for main course of Slow Braised Daube of Scotch Beef before the concluding part of the tale. 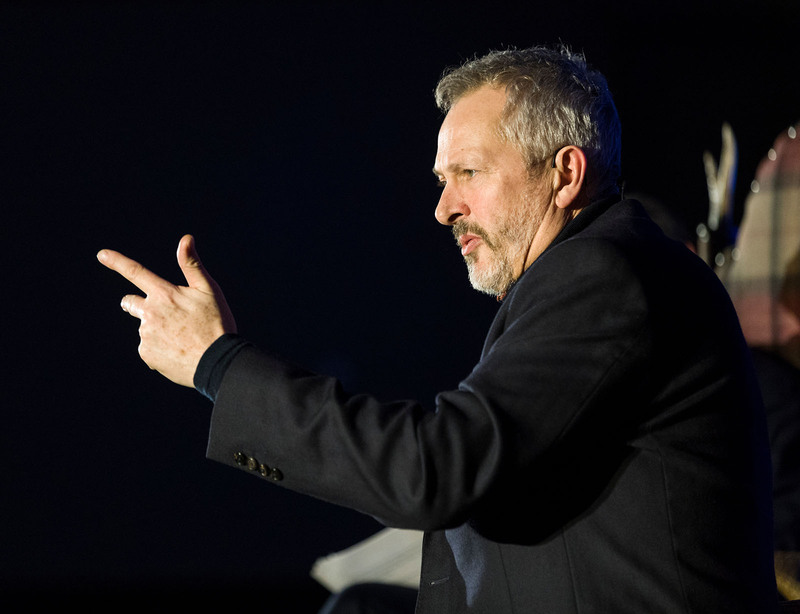 Television beckoned and Nick grasped the opportunity with both hands initially fronting his own shows Wild Harvest and Island Harvest before becoming a well loved celebrity chef on Ready Steady Cook. Multiple books followed by the opening of two Cookschools, three seasons of the Great British Menu and cooking the main course at the banquet for the Queen’s 80th birthday. More recently he has been gallivanting with his chef buddy Paul Rankin in Ireland, Scotland the USA and Canada in Paul & Nick’s Big Food Trip. Closer to home he continues to shout from the rooftops about Scotland’s fabulous natural larder and work towards ways in which Scotland can continue to improve its relationship with food through better school meals and food education. Following dessert of Malt Whisky Cream with Macerated Berries it was time for the fun part of the evening - the audience Q&A session. With the offer of a half day for 2 at the Cookery School up for grabs for the best question there were plenty of hands in the air. 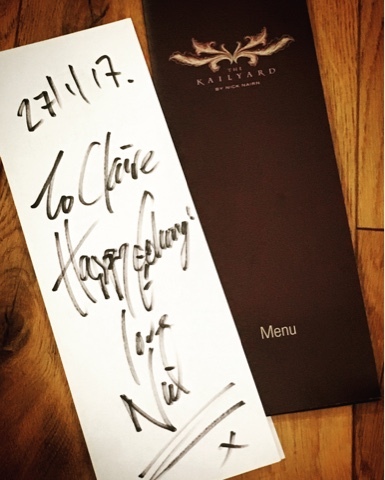 Amongst other things I now know that Nick's food heaven is Scottish Seafood, hell is Reindeer Testicles and last meal would be a Bacon & Egg Roll cooked by Paul Rankin. 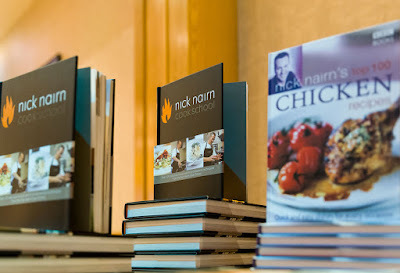 The evening ended with a chance for guests to meet Nick, grab a selfie and purchase a cookbook or one of his ubiquitous cook school board scrapers. Entertainment continued with a live band (most definitely not Jim MacLeod and his Scottish Dance Band) but we headed through to the Cocktail Bar for a nightcap. A wonderful selection of Scottish gins, alas no premium tonics, but knowledgeable barman and all the correct garnishes meant we enjoyed Strathearn, Eden Mill, Rock Rose and Caorunn before I caused great consternation by ordering a Baileys and Amaretto in the same glass. I can assure you that it is truly a wonderful 'one for the road'. 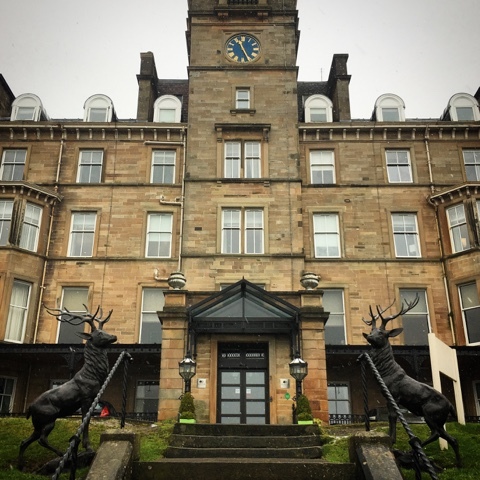 After a comfortable nights sleep, breakfast up to 11am at the weekend was most appreciated and we enjoyed the full Scottish with black pudding and haggis before heading to the leisure facilities for a quick swim, steam and sauna. 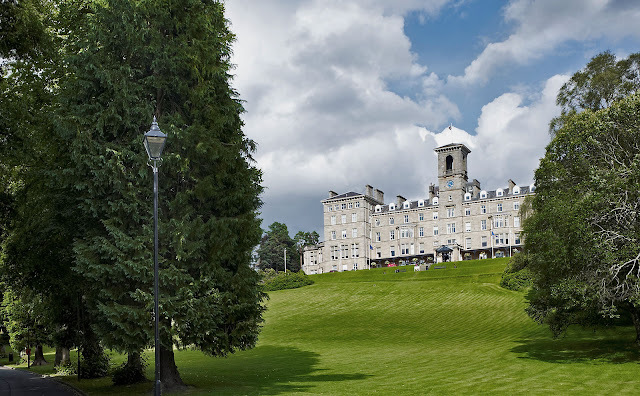 A wonderful start to the weekend, Dunblane Hydro is truly a little luxury in the heart of Scotland. 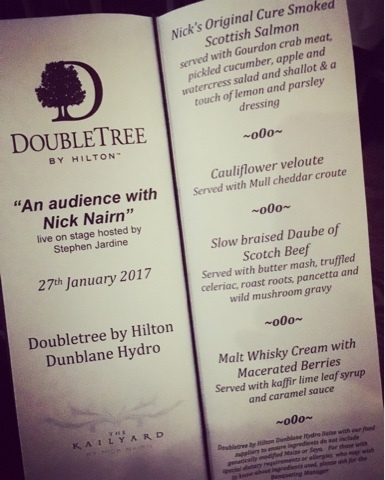 Disclosure: We ate and stayed as guests of DoubleTree by Hilton Dunblane Hydro. All views expressed are my own. 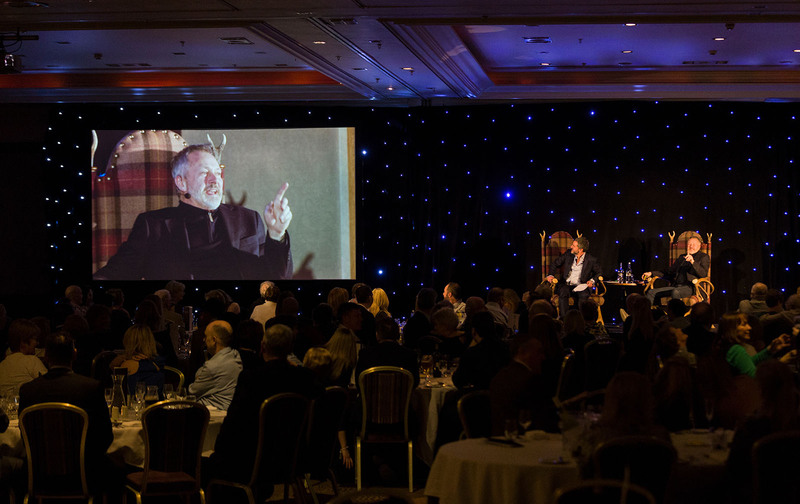 Additional photography courtesy of Dunblane Hydro.